A plurality of South Koreans (44.5%) identified themselves as belonging to the lower class. However, there is division on paying more taxes to fund an expanded welfare system. While 46.9% said they would pay more, 48.4% said they would not. November saw the on-going scandal involving the United Progressive Party (UPP) and the alleged seditious acts of some of its members enter a new phase. Upon President Park’s departure for a series of summits in Europe, a motion to disband the UPP was tabled by Prime Minister Jung Hong-Won and then electronically approved by the president. This raised eyebrows for obvious reasons and was widely seen as President Park avoiding messy domestic politics—something quickly becoming a hallmark of the Park presidency. The move does not immediately dissolve the UPP, as it must first be authorized by the Constitutional Court which has six months to reach a decision. But the motion clearly creates space for controversy as such a dissolution would be the first of its kind since 1958. Despite the headlines this motion attracted around the world and the largely negative optics, it is not nearly as controversial domestically as one might assume. Although the Asan Institute no longer includes the UPP in its regular polling on party support, it was included in the polling in the lead up to the National Assembly elections in April 2012. At that time, the UPP consistently polled at about 10%. Of course, this was before it was hit with a primary rigging scandal and subsequent allegations that some of its members were plotting an armed overthrow of the South’s government. In a poll conducted from November 5-7, only 3.1% reported being favorable towards the UPP, and 46.7% rated it with “zero” favorability on a zero to ten scale. While this is not the same metric as party support, it does give an idea of just how out of step the UPP is with the rest of Korean society. In the November 5-7 survey, 50.1% favored disbanding the UPP—56.2% approved in early September—with 31.5% opposed. Those opposed skewed heavily towards the 20s and 30s age cohorts, but this is not to say that these cohorts are strong supporters of the UPP. They were as unlikely as any other age cohort to cite the UPP as being favorable. Instead, they likely oppose the attempt to disband the UPP because such a move is seen as a relic of an authoritarian past and feel the Park administration is overstepping its democratic mandate. The events leading to the disbanding of the UPP began in late August when the offices of then-National Assemblyman Lee Seok-Ki were raided by agents of the National Intelligence Service (NIS). The NIS accused him of plotting an armed rebellion at a meeting of the socalled “Revolutionary Organization”. This precipitated a series of embarrassing statements from Lee Jung-Hee, the head of the UPP. She first denied that such a meeting had ever taken place. When that position proved untenable, she changed her story to say that the NIS was fabricating the comments. 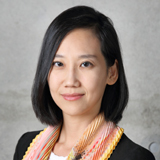 The NIS then produced an audio recording, leading Ms. Lee to say that the comments had been taken out of context and were, in fact, “a joke”. Mr. Lee was technically immune from arrest and prosecution at the time his offices were raided because he was a sitting National Assemblyman. However, by early September his colleagues had voted to remove that immunity and he was taken into custody. Although Mr. Lee is technically still a member of the National Assembly, a poll conducted September 8-10 revealed that 69.7% supported his expulsion from the National Assembly. Mr. Lee’s trial began in mid-November, and the outcome is pending. President Park’s approval ratings have been surprisingly resilient—64.2% as of November 15 (Figure 1)—despite serious initial missteps and ongoing scandals. The first prong of her strategy has been to remain above the domestic political fray, relying heavily on the loyalty of her senior staff to tackle difficult domestic situations. The second prong of this strategy seems to be strict media discipline and message control. As a Chosun Ilbo op-ed pointed out, President Park has yet to hold a “proper” press conference. By this point in his presidency, Lee Myung-Bak had held 14. However, it is worth noting that international summits are subject to a decreasing marginal effect. While they were once able to provide small, but short-lived approval bumps, that effect has disappeared. Other polling has confirmed this. However, this survey also revealed that the president is perceived as relatively weak on domestic issues, with only 50.1% approving of her domestic performance. This is somewhat worrying for a risk-averse administration struggling to get its domestic house in order. Its proposed bill on taxes failed after public backlash, and it was forced to backtrack on the scope of its pension plan for the elderly. There is also the ongoing NIS election interference scandal, as well as a Blue House staffer now being tied to the ouster of the former Chief Prosecutor. Unsurprisingly, there were large age gaps in her handling of domestic issues—just 39.4% of those under 40 approved. Yet, despite her rollback of promised pensions for the elderly, 66.7% of those aged 50 or older approved of the president’s handling of domestic issues. There is now every reason to believe that—much like during the Lee Myung-Bak administration— those 50 and older will be steadfast supporters of President Park throughout her term. The good news for the Park administration is that getting the domestic house in order should not be interpreted as a need to directly tackle the ongoing NIS scandal. While this scandal has made for good headlines, it has resonated very little with the public at large. A major reason for this is that the Democratic Party (DP) is simply not seen as a viable opposition party. Its efforts to utilize the NIS scandal to mobilize the public—including a 101-day protest in front of City Hall initially aimed at reigniting the candle light vigils of the Lee Myung-Bak administration—have failed thus far. 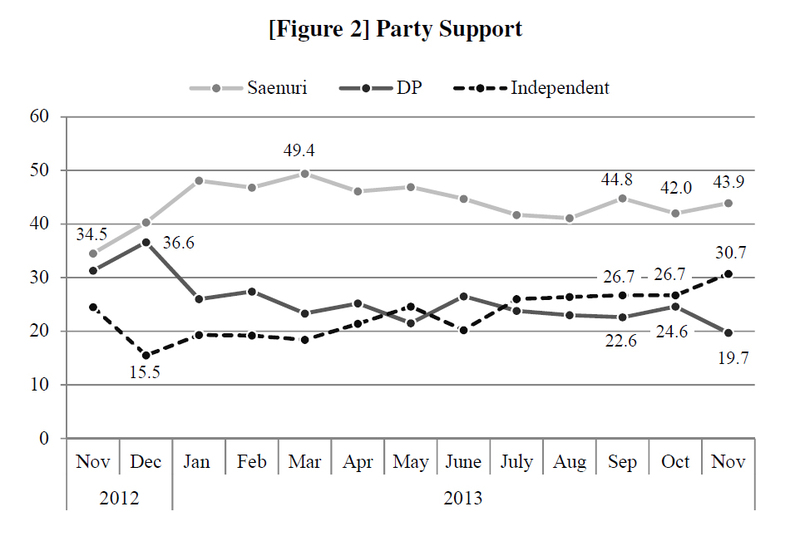 The DP now finds itself at its lowest level of support in the past year (Figure 2). Instead, President Park has rightly—in terms of public opinion—focused on the economy, making it an important part of all of her summits. Economic redistribution is no longer a pending issue for the Korean public. 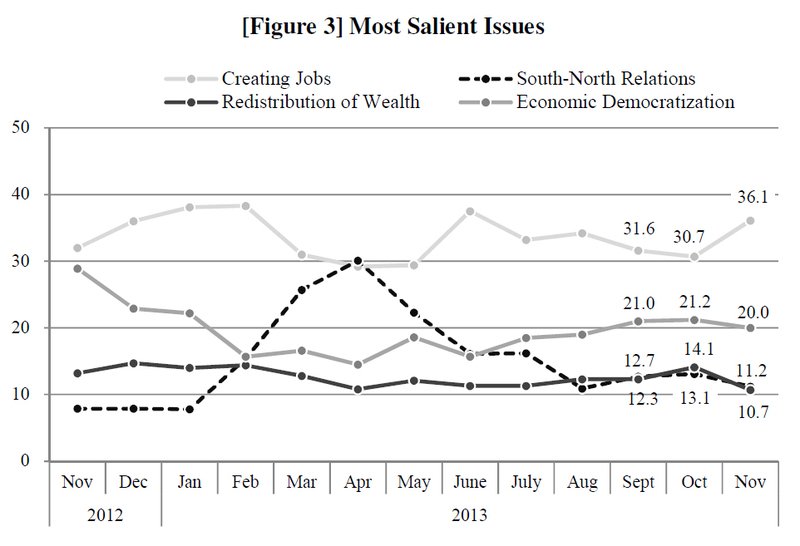 For 12 of the past 13 months, creating jobs has been the primary concern (Figure 3). It was eclipsed only one time by South-North relations when tensions were running high, and even then it was within the margin of error. It could be argued that issues related to redistributive policies rival that of economic growth as the redistribution of wealth (10.7%) and economic democratization (20.0%) could be seen as a single issue. However, these issues were effectively split during the 2012 presidential campaign, and it is in the interest of President Park to maintain that split. Thus far, her administration has made little progress on redistributive policies and is now under no great pressure to do so. The DP is in such disarray and trusted so little that it is incapable of pushing these issues to the forefront of the public agenda. The inability of the DP to act as a viable opposition party presents an enticing opportunity for Ahn Cheol-Soo. There are already reports that he is quietly building a nationwide network, and in the last week of November Dr. Ahn held a press conference where he announced he would begin to consolidate support as well as form a ”Committee for Striving for New Politics”. As is usual with Dr. Ahn, details were elusive but he did announce that the formation of a new political party was in the works. Asan polling indicates that should he form a new party, it would enter the polls as the second most popular party, garnering 21.4%. In the process it would decimate the DP, dropping its support to approximately 10.0%. It would also draw some support from the Saenuri, driving its support into the mid-30s. Throughout the first year of President Park’s term, there has been increasing attention paid to her attempts to rebuild the relationship China—one that had withered under her predecessor. 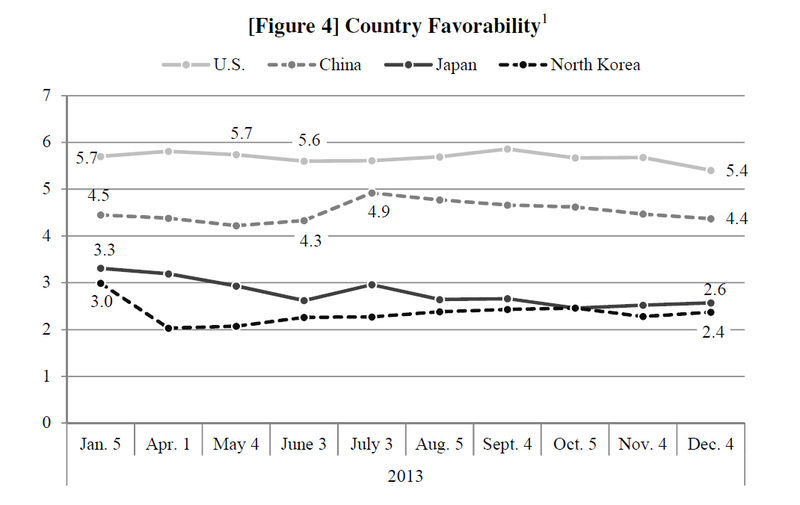 The rapprochement was greeted with great fanfare in the Korean media, and the late-June Park-Xi summit created an immediate bump in the favorability of China (Figure 4). However, this increase was not sustained over the latter half of the year. By early December, the favorability of China was actually below the mark for January. China’s late-November expansion of its air defense identification zone (ADIZ) had no discernible impact on Korean attitudes toward China—at least in terms of favorability. Since July, that score was in steady decline and the mark for December did not deviate from that decline. The media was measured in its response, and this likely carried over to the public’s interpretation of the expansion. 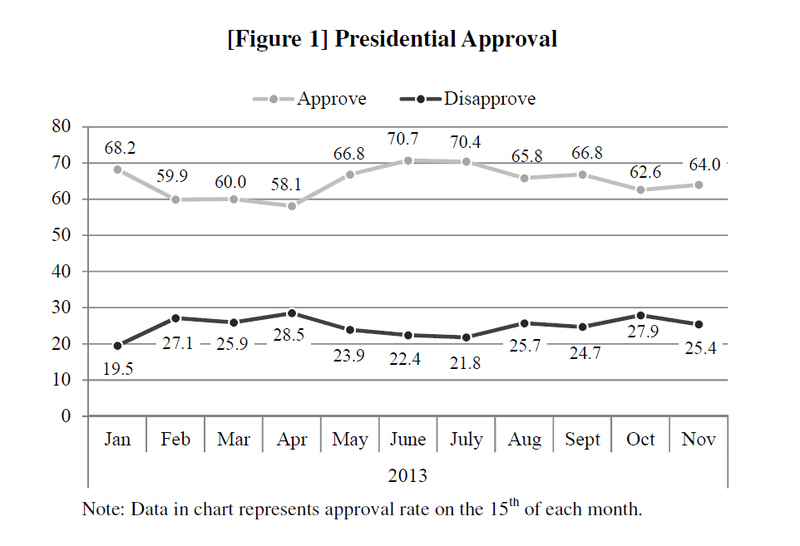 With regard to the favorability of the United States, the decline from May to June should not be interpreted as a negative reaction to the Park-Obama summit. There are two reasons for this. The first is simply the timing of the poll. The Korea-U.S. summit took place in early May, but after the May survey, and by June the country’s attention had been redirected. Second, attitudes towards the United States are largely positive and steadily so. The fact that it is not now subject to volatility speaks to the strength of the relationship at this point. However, it should not be interpreted as being beyond volatility. Given the correct circumstances, anti-Americanism could quickly be revived. There is a very real sense in Korea that it is in danger of becoming ensnared in a competitive relationship between the United States and China. This sense has informed the way the South Korean media has covered the Park administration’s approach to China, and was also evident in how it covered the expansion of China’s ADIZ. China occupies something of a middle ground for South Koreans. 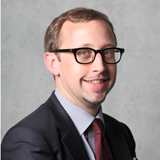 While the relationship with Japan is clearly competitive, and the relationship with the United States is clearly cooperative, there are still many unanswered questions with regard to China’s intent as it continues to rise. Much like country favorability, the Park-Xi summit altered Korean perceptions about the nature of the Korea-China relationship in the short-term. 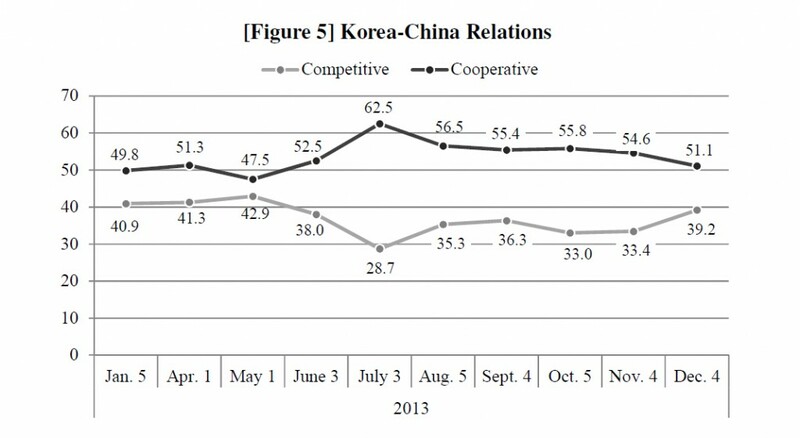 Early in the year, Koreans were largely divided on whether that relationship was competitive or cooperative. However, the summit drove a large increase in the number of those who cited it as a cooperative relationship. But like the result for favorability ratings that increase was not maintained. By December, the results had returned to the levels shown at the beginning of the year. Regardless of repeated statements by U.S. officials that it seeks a cooperative relationship with China, that message is apparently not effecting how the South Korean public views that relationship. While the announcement of an expanded China ADIZ had a moderate effect on Korean perceptions of China, it was seen as a sign of increasing U.S.-China competition. In December, the spread between perceptions of competition and cooperation reached its largest point, with a gap of 49.3pp (Figure 6). However, the Korean public is also very sensitive to positive developments in the U.S.-China relationship. In mid-April Secretary Kerry visited China, primarily to discuss issues related to North Korea. This was well-covered in the Korean media and seems to have carried over into the polling results for May 1. 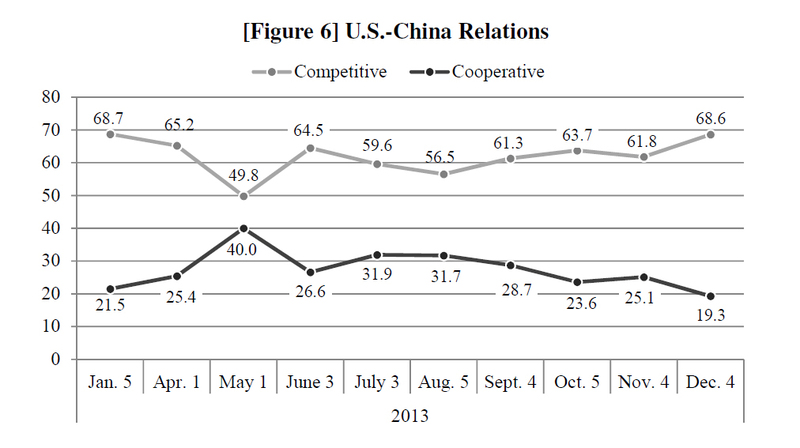 It created a sharp one-time decline in the number of respondents who viewed the U.S-China relationship as competitive. But this was a shortlasting effect. By early June, that number had returned to previous levels. 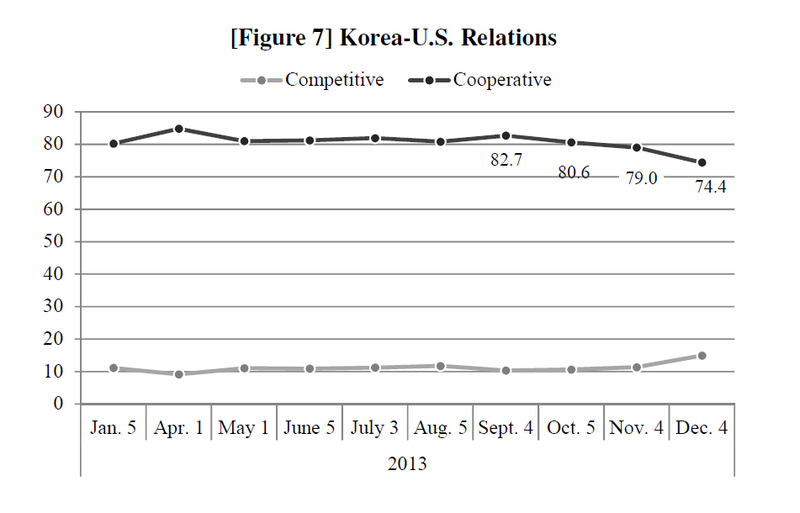 As noted previously, the Korea-U.S. relationship is overwhelmingly seen as cooperative (Figure 7). However, that perception has declined every month since September, shedding 8.3pp. The primary driver of this decline is not clear, but U.S. support for Japan as it seeks to increase the role of its collective self defense seems most likely. This rankled many in South Korea. While the official announcement by Secretary Kerry took place in early October, there has been a steady stream of stories covering the U.S. backing of an increased role for Japan’s military. The domestic political situation is still one mired in controversy. The opposition parties remain obstructive, and both the ruling party and the presidency have, rightly or wrongly, done little to address its concerns. Worse, there is little to no prospect for improvement moving forward. The public has clearly not embraced tactics employed by the DP, and yet it has done little to change its approach. The focus will continue to be on pressing the administration on its handling of all aspects of the NIS scandal. The public, meanwhile, will continue to see its frustrations grow with all involved parties for inadequately addressing the needs of the country. The regional situation is also one that requires close monitoring. Despite the movement by President Park to improve the relationship with China, it is much too early to view this as a concerted effort to actually move closer to China. For one, it is not clear that the Korean public—which can exert a strong influence on South Korean foreign policy—would accept such a move. But if the U.S.-Sino relationship becomes seen as increasingly competitive, it will continue to put pressure on Korea’s leadership to please all sides. It remains to be seen if this can be done. The sample size of each survey was 1,000 respondents over the age of 19. The surveys were conducted by Research & Research, and the margin of error is ±3.1% at the 95% confidence level. All surveys employed the Random Digit Dialing method for mobile and landline telephones. 1. This question is asked on a zero to ten scale, with zero being “zero favorability”. A mean score is then calculated and presented in the figure.